Did the battery life scale accordingly, is it still the same, or even better? That’s what we’re here to find out. The Galaxy S III mini is officially rated at just over 7 hours on a 3G network, but we found that the battery ran out earlier, hitting 0% at the 6 hours and 22 minute mark. That puts it near the bottom of our charts, but still ahead of the Sony Xperia P, which uses the same chipset as the S III mini but a smaller battery. 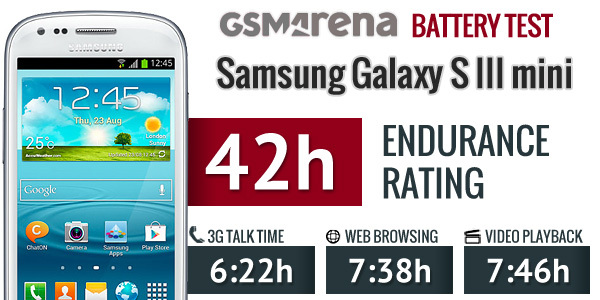 Moving on to web browsing, the Galaxy S III mini redeemed itself with 7 hours and 38 minutes, placing close to the top. Jelly Bean’s browser optimizations sure help here – just look at the Galaxy Beam, which has a 500mAh advantage but scored way lower in the chart (it was running Gingerbread at the time of the test). Video playback also proved a strong suit for the S III mini as it came 15 minutes short of the 8 hour mark. While the 4″ screen isn’t quite ideal for watching videos, the Super AMOLED offers good image quality (no tiny text to make the PenTile matrix visible) and sunlight legibility is pretty decent. By our calculations, the Samsung Galaxy S III mini will last you 42 hours between charges if you do an hour each of talking, browsing and watching videos per day. Heavy callers might need to charge the S III mini more often than others, but the diminutive droid should last you about as long as the big S III if you concentrate on browsing and watching videos.